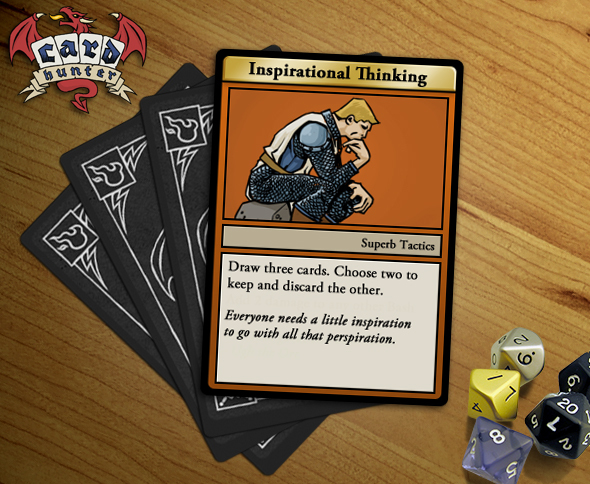 After last week’s terrible card, let’s take a look at something that is a bit more inspirational. Yeah, this is just strictly a great card, as anyone who has played a collectible card game before will tell you. Drawing more cards doesn’t sound that great when you first think about it – after all this card doesn’t smash face or hurl giant fireballs. But what it does do is get you more cards to do just that. Assuming the rest of your deck is good stuff – not Dropped Guards – you’ll end up with one more card in hand after you play this than you did before. And, as a nice bonus, you get the two best cards out of the next three. So, if one of those cards was Dropped Guard, it’s now in your discard pile, not in your hand. This card is soooo good. Any card that puts more cards into your hand, be it from the boneyard or your draw pile is always a good thing! So, cards can also come from character abilities, in addition to equipment. Nice.